So, y’all have heard of a Classy/Trashy Tree, right? This is a term that I keep hearing about from my friends out there in the blogworld, so I’m joining in this year. I’ve got my classy tree set up downstairs in the sun room. Here it is at night, which you might have already seen over in my Chistmas tree photography post. Look at this silly dude. 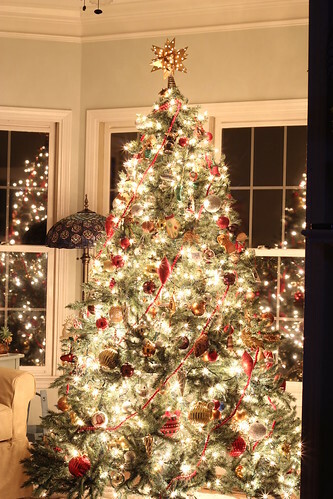 I used another new night time technique to get sparkling photo of my tree this year. It resulted in a starburst effect on every light. Very cool. I cranked the shutter speed down as loooooow as it would go, set the ISO at 100 and the aperture at f/9 so it would all be in focus. Then I set up the tripod, set the camera on the self timer mode so my shaky finger wouldn’t cause a blur, hit the button and stood back and waited for the result. It took a loooong time for the photo to snap, but when it did the result was a starburst pattern on every bulb. Thanks to pinterest for leading me to It Works For Bobbi Blog. It’s a great effect on a tree, don’t you think? So now that you’ve seen the classy tree, let’s move upstairs to the trashy tree. This crazy kid is sitting on my balcony. I scored this tree on sale at Old Time Pottery’s Black Friday sale for $39.99! Can’t get much cheaper than that for a six foot tree. And I even got this crazy kid to sit in front of it for another photo op! Appropriate that he was wearing his Animal shirt for this pic. This is where I put all of my kissing fish and other funky fun Christmas ornaments. I have this ginormous collection of Katherine’s kissing fish that I’ve purchased or been gifted since 1999. I’m hovering around the 40ish mark on kissing fish, I believe. It was time for the fish to get their own place. 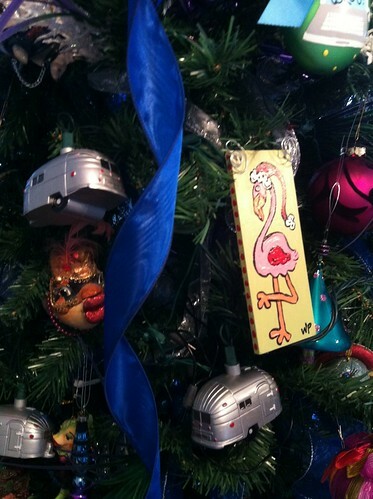 I even have a pink flamingo on the trashy tree. And of course, no trashy tree is complete with a set of silver bullet trailer string lights. I like my trees just a little on the trashy side. So there you go, my classy / trashy tree pics! Oo I’m going to try a shot like that – thanks Beth! Your photos and tree are so pretty too!!! I did the same thing without even realizing it. I never hear of classy/trashy tree. 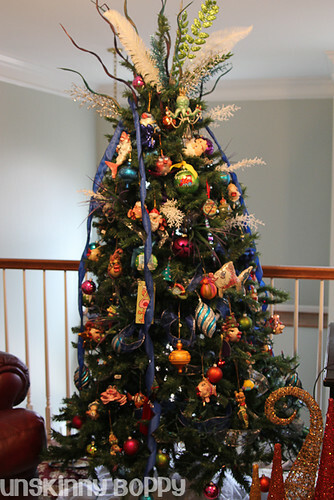 I just like to have one tree pretty and stylish, but then what do you do with all the extra ornaments?? So, I picked up a $40 pre-lit tree from Walmart and we trimmed a kids’ tree. My classy tree is in our sitting/living room in front of the window, and trashy is up on our balcony. I’m seriously obsessed with the trailer lights. Must own some! Is it strange that I love them both? And those trailer lights are too cute! 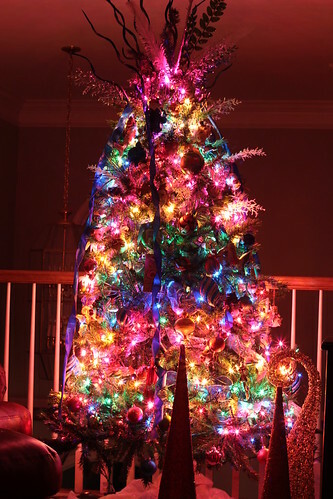 Also, my husband would be thrilled if I put up a tree with colored lights. For some reason, he loves them. Maybe next year. 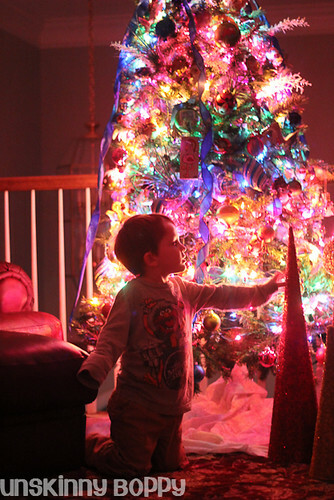 Love the Christmas tree photos and the trashy tree! So fun! 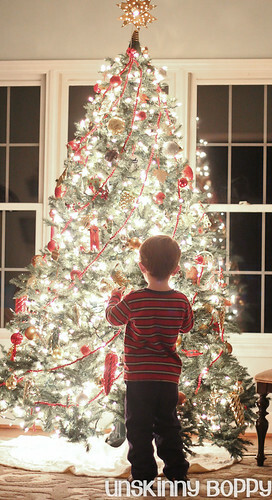 I have two trees that I call mom’s formal tree (in the living room) and the fun kids tree (in the family room). Not as catchy as classy and trashy. But it could almost fit in. 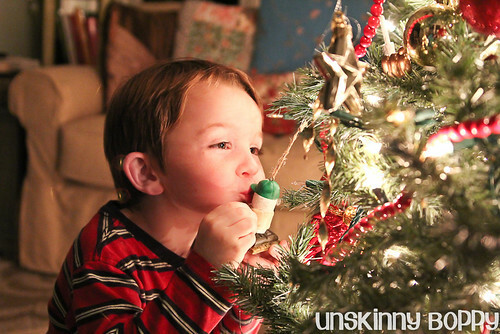 My kids tree is covered in Peanuts ornaments. As well as all the fun things they have made over the years and the ornaments that play music etc…. Beth – I literally LOL @ this post! Never heard the term classy/trashy tree until now. 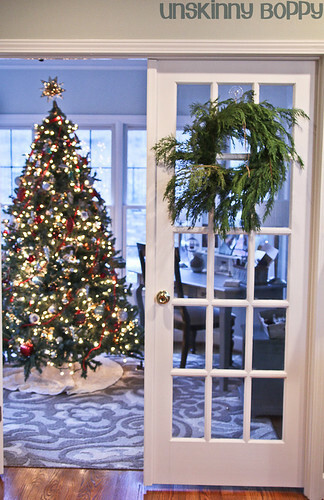 I have always had a hard time choosing between a classy/more traditional-themed tree vs. a fun, creative/trashy tree! next year, i may just have to do both like you. 🙂 <3 all your Christmas ideers. TOO COOL!! I love them BOTH!!! Classy / Trashy tree is the perfect term for this! I was trying to explain to my husband today about my desire for multiple trees. 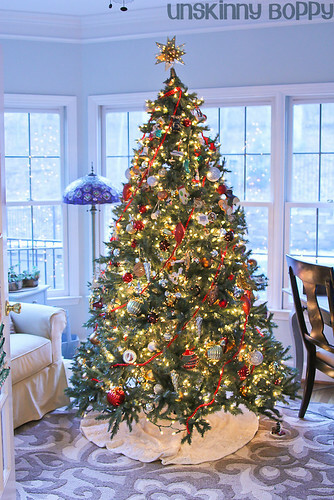 I want my classical pretty tree, and a “tree divided” tree to represent our respective colleges and sports. And, I want (what I called) the ugly tree. I want a place to put all of the sentimental ornaments that just all clash and do not “fit” on my pretty tree!!! If I ever have a house big enough, I want a bunch of trees! For now, I have to move a bookshelf to the garage to make room for just one tree! Your trees are wonderful!!! Thank you!